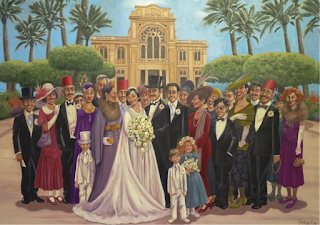 The Egyptian Muslim historian Maged Farag will fly in to Israel to open on Tuesday 5 May an exhibition of paintings recalling the heyday of the Jewish community of Egypt. Entitled, Celebration of a Golden era, the exhibition consists of paintings by Camille Fox, an Egyptian Jewess now living in Australia. It will run until 5 June at the Centre of North African Jewish heritage in Jerusalem. Mr Farag's visit concludes the three-day International Congress of Jews from Egypt, whose main focus is the preservation of Jewish holy sites in Egypt. The visit would have been inconceivable two years ago under the Mubarak regime, which 'froze' the relationship between Egypt and Israel despite the signing of the 1979 peace treaty. For Arabic speakers, here is a recent TV interview given by Mrs Levana Zamir, chairman of the Egypt-Israel Friendship association in Israel. Here is Lucy Aharish interviewing Levana Zamir in English about the 'cold peace' between Egypt and Israel.